The exhibit of Antonio Pineda jewelry at the Folk Art was fantastic. If you like jewelry in particular, and design in general, and can get there before January 2, I urge you to go. For more images and history you can buy the exhibition catalog on Amazon. I'm tempted. I didn't take my camera, because I kind of hate taking photos in museums, and it's often prohibited, but I did dig up a couple of images of some of my favorite pieces. The lighting was really dim in parts of the exhibit. I understand that sometimes materials are light sensitive, but silver? I'm pretty sure they could have up'd the light candles so that the colors of the stones were actually discernible. On the plus side, the introductory signage was all displayed on a wall painted that lovely Barragan pink. 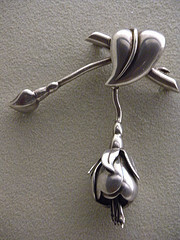 This articulated fuschia blossom brooch really appealed to me. 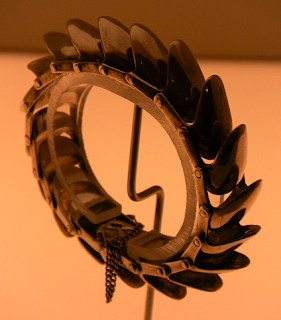 This bracelet was inspired by an armadillo shell. Obviously there was much more, and to get a glimpse, you'd be better served by these videos put together by the Fowler Museum at UCLA, where the exhibit originated. The first is the short version, for those of you with a time crunch. I recommend the second, it's only 7.5 minutes long, and you get to see a lot more of the work. Exhibition: Silver Seduction - The Art of Mexican Modernist Antonio Pineda from Fowler Museum on Vimeo. Silver Seduction: The Art of Mexican Modernist Antonio Pineda from Fowler Museum on Vimeo.